Working to be a Green Church! Peace and justice is God’s plan for all creation. The earth and all creation are God’s. God calls us to be careful, humble stewards of this earth, and to protect and restore it for its own sake and for the future use and enjoyment of the human family. - from the Presbyterian Earth Care Pledge. Warner is certified as an Earth Care Congregation through the Environmental Ministries of PC(USA). Warner's Environmental Stewardship Team provides guidance and inspiration to the congregation as we live out our Earth Care pledge in four areas: Worship, Education, Facilities and Outreach. Educates the congregation about renewable energy credits, energy conservation, toxic waste disposal, bottled water and ways we can individually act to reduce our CO2 footprints. See how you can learn more here. Monitors the Shepherd's Garden that provides produce to Shepherd's Table in Silver Spring. Click here to see the gardening plan for 2014. Provides recycling of used batteries, printer cartridges and cell phones. Bring your items to church and place them in the marked baskets in the hall behind the sanctuary. 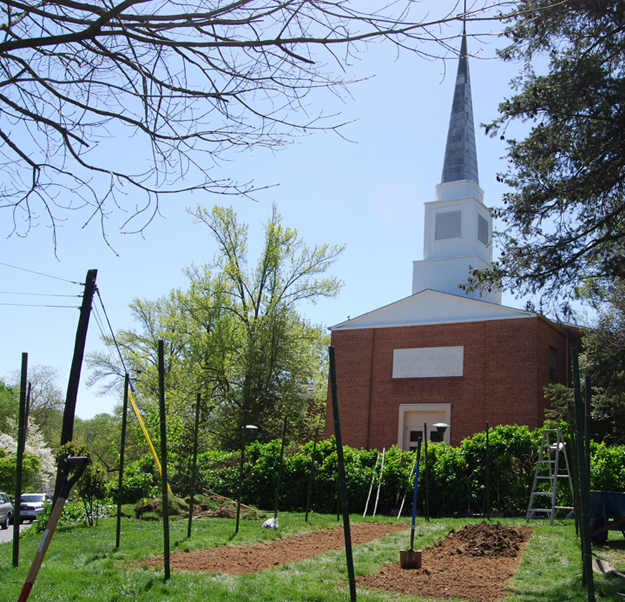 We may have a red brick building, but we are working to be a green church!